Corsair announces the upcoming availability of the AX1500i, one of world's first power supplies with 80Plus Titanium rating. This 1500W model will be available by the end of May for $449.99. According to the 80Plus test report (conducted at 115V), this unit has a 91.23 percent efficiency at 10 percent load, 92.63 percent efficiency at 20 percent load, 94.04 percent efficiency at half load and 91.34 percent efficiency at full load. 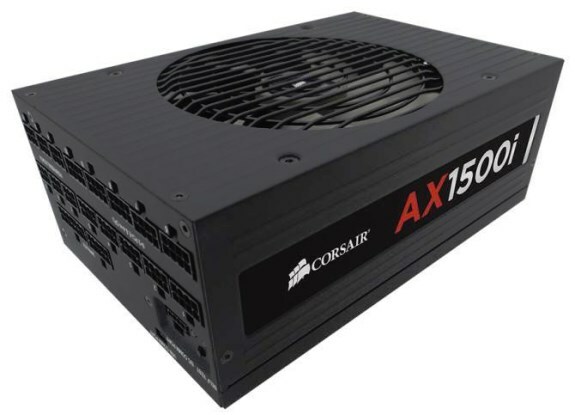 Corsair®, the most awarded PC power supply brand in the world1, today announced the availability of the much-anticipated AX1500i Digital ATX power supply from www.corsair.com. Using advanced digitally-controlled circuitry to deliver ultra-stable power at over 94% efficiency, the AX1500i is the first 1500 watt PSU to meet the ultra-efficient 80 PLUS Titanium standard. The AX1500i will also be available from retailers in late May. Using Corsair’s second-generation digital architecture, the AX1500i uses a Digital Signal Processor (DSP) to control power output, resulting in tighter DC voltage output regulation and superior stability for your valuable PC’s components. The AX1500i’s incredible efficiency also results in greatly reduced heat, allowing the PSU to operate in a truly silent Zero-RPM fan mode at loads of up to 450W. Even when delivering its maximum 1500W of power, a high-quality 140mm Dynamic Fluid Bearing (DFB) fan allows the AX1500i to operate quietly. With 1500W of power on tap, the AX1500i is equipped with a huge array of cabling choices allowing it to power even the most demanding 4-way SLI and CrossFire X setups. Combined with the power of Corsair Link™ technology, enthusiasts have access to an incredible range of control over their PC’s power, with real-time temperature, power usage and efficiency monitoring right from the desktop.